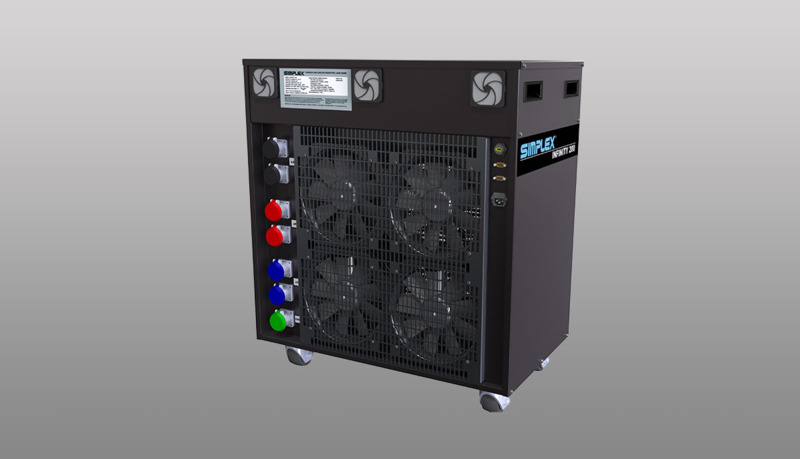 The new Simplex Infinity 200 is simply the most advanced factory-standard load bank available anywhere. Digitally controlled infinite loads—simply enter any value from zero to max, and the load bank goes there. Ramp-up, ramp-down, infinitely. Roll-in, roll-out, 360-degree casters, forkliftable, connect up to 2 x 4/0 per phase. 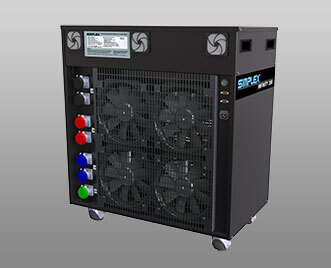 Daisy chain up to 40 Infinity or Powerstar load banks. Upon initial start-up , the Infinity controller measures the applied voltage and calibrates the loads to that voltage. Therefore, at intermediate voltages, such as 440v, 416v, 220v, 208v, the load bank controller calibrates for the reduced capacity. Within the capacity of the load bank, the load requested is the load applied.